This is my new favorite way to cool down and enjoy a sweet treat. Vietnamese coffee is strongly brewed coffee sweetened with condensed milk. A few weeks ago we got to visit with my brother and his family. They were in the United States for a visit from Vietnam. We were lucky to be able to spend some time with them and their kids. Miss O is only a month a part in age to one of her cousins. It was fun to see them interact and play. Even though they came half way around the world and trekked with two kids and all of the gear that comes with two kids they kindly brought us some foodie Vietnam finds. I mean what better gift can you think of than chocolate and coffee? We have been the recipient of Vietnamese coffee before and man is it good. Maybe it is because I know it is authentically made from across the world but it is so much better than the typical run of the mill coffee from the store. Even the good stuff. Anyway, said coffee is good own its own but for a while now I wanted to try out Vietnamese Iced Coffee. The concept is pretty simple, add sweetened condensed milk to chilled iced coffee. I just haven't done it yet. Until last week. It was hot. I was hot and grumpy and tired. Well if you are hot, grumpy or tired or all three try out a glass of Vietnamese Iced Coffee. It is sure to turn you bad mood upside down. Feel free to use regular coffee, it is still good and worth having. Many a times now I make quick cup from the Keurig for a single afternoon treat. A cup of Vietnamese Iced Coffee is cool and refreshing and oh so sweet. Steep coffee grounds in a heatproof container with 2/3 cup boiling water for 4 minutes. Pour through a coffee filter into a heatproof glass. Or make coffee through a regular coffee maker. Cool coffee in refrigerator till cold, about an hour. Stir in condensed milk until blended. Add ice, stir, and serve. I posted about a Greek feast on Monday. Part of that feast was this Greek salad. Nothing eye opening here but it was a nice way to change up the typical lettuce salad with something different. The recipe is super simple but packs a big punch of flavors. The key is the fresh mint and parsley. Despite the little rain lately our herb garden is going fairly strong. Add to the herbs a block of feta and olives and you got a great salad. I don't care for the olives, a bit too strong of flavor for me. Mr. J loves them though so they stayed in the recipe and I picked them out of my serving. For those of you who don't have a strong preference against olives the recipe doesn't have many to begin with so the olives don't overwhelm the salad. This Greek salad is light but filling and a perfect side to many a meal. Combine parsley, tomatoes, cucumbers, and onions in a bowl. In a small bowl, whisk together oil, vinegar, and oregano; season with salt and pepper and pour over cucumber mixture. Toss. Transfer salad to a serving bowl and top with feta and olives. Garnish with more oregano; season with pepper. For the last month we celebrated with a Greek feast for Corelli's Mandolin by Louis De Bernieres. This is a new to me novel. Sadly I still haven't gotten a chance to read it. It is on my bed stand just waiting for me next trip. The synopsis sounds good and I am pretty confident I will enjoy the novel. It's a love story during WWII but this story takes place on a small Greek Island, not the typical France or Germany. Hence the Greek feast. Corelli and his Italian soldiers occupy the island. Corelli takes up residence with Dr. Iannis and his daughter Pelagia. Although unwelcome Corelli is charming. The novel starts at the invasion of the island and spans through the effects after war. It has been horribly hot and humid around Connecticut. We don't have A/C so I had the hardest time thinking of a Greek recipe. Or to be more accurate all of the recipes I wanted to make required oven time and that was not going to happen. Finally I saw this recipe for kebabs. Meant to be made under the broiler but we made the pork kebabs or souvlaki on the grill. Topped with a yogurt mint sauce these were a delicious dinner. Want to join in the fun? Read all about this month's book selection from our host and leader Camilla in her invite post. 3. Include a link back to the hosting blog somewhere in your post. Make the pork kebabs:Whisk together the wine, oregano, cumin, salt, thyme, cinnamon, and garlic in a large bowl. Add the cubes of pork and toss well to combine. Cover the bowl with plastic wrap and set aside to let marinate for at least 2 hours or overnight in the refrigerator. Grill the kebabs on medium high heat until browned on all sides and cooked through, 20-25 minutes. Arrange the skewers on a platter and scatter the scallions and parsley over them. Serve with the yogurt sauce and the pita. I am popping in today to give you a quick and fun recipe. I saw this in Cooking Light this month and immediately knew I wanted to give it a go. I am always trying to find ways for Miss O to eat more veggies. She actually really likes them. Steamed broccoli is a favorite as is sauted green beans. But those can get boring for the adult people in her life. She is hit or miss with zucchini. This recipe is for any squash but we used zucchini. Simply slice and top with cheese and bread crumbs. Squash Nachos. Get it...squachos. I thought it was super cute. Mr. J not so much. Miss O wasn't as thrilled as I had hoped. She ate one. I ate the rest and loved every last one. Coat a foil-lined baking sheet with cooking spray. Arrange squash in a single layer on pan; sprinkle evenly with cheese and panko. Broil 3 to 4 minutes or until cheese melts and squash begins to brown. Remove pan from oven; sprinkle with chives, salt, and pepper. Hello my loves! Time got away from me once again. Summer activities. Work travel. Life. Plus it has been a bazillion degrees lately and super humid. I have avoid cooking like the plague. Before all of that happened I made this cake. Have you been a part of the snack cake fad. I am not the biggest fan of frosting so I am a fan of snack cake. Also, no making frosting and no waiting for the cake to cool is a bonus for me. Some where deep down I also justify this no frosting cake as healthy. My logic. That is all. This almond cake is super rich. You use a whole tube of almond paste. I love almond paste and don't use it nearly enough. It just smells so good. I sat in the kitchen sniff it up quite a bit before I put the tube in the batter. Rhubarb also finds its way into the batter making this almond rhubarb cake very summery. So let's recap shall we? That's about it for today. Make this cake it is super delicious and the perfect sweet treat for your next summer dinner party. Arrange a rack in the middle of the oven and heat to 325°F. Coat a 9x13-inch baking pan with cooking spray or a thin layer of butter, then dust with flour and tap out the excess; set aside. Whisk the 1 cup flour, baking powder, and salt together in medium bowl; set aside. Place the butter, sugar, and almond paste in the bowl of a stand mixer fitted with the paddle attachment and beat on low speed until the sugar is mostly incorporated, about 1 minute. Increase the speed to medium and beat until thoroughly combined and the mixture is fluffy, about 5 minutes. Stop the mixture and scrape down the sides of the bowl and the paddle with a rubber spatula. Return the mixer to medium speed and add the eggs one at a time, letting each one incorporate before adding the next, about 2 minutes total. Add the vanilla and beat for 30 seconds more. Stop the mixer and scrape down the bowl and paddle again. Add the flour mixture and turn the mixer on to low. Mix until just combined and no visible streaks of flour remain. Add the rhubarb and fold in with a rubber spatula. Scrape the batter into the prepared baking dish and smooth into an even layer. Sprinkle with the almonds. Bake until a cake tester inserted in the center comes out clean, about 50 minutes. Remove to a wire rack and let sit at least 45 minutes. Dust with powdered sugar, if using, before cutting and serving. As part of The Book Club Cookbook I was also able to participate in the Unearthed Blog Party. The book, Unearthed : Love, Acceptance, and Other Lessons from an Abandoned Garden was released to the public this month and to celebrate myself and several other bloggers are reviewing the book and sharing recipes that came from the book, the author or were inspired by the book. 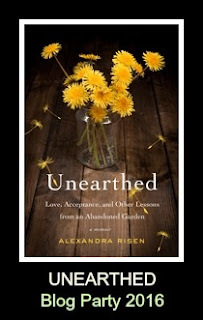 Unearthed : Love, Acceptance, and Other Lessons from an Abandoned Garden by Alexandra Risen (Houghton MIfflin Harcourt, July 5, 2016) is a memoir about Alexandra finding herself and her family's history through the restoration of a large garden. The memoir begins with the death of Alexandra's father. She lives in a different city from her family and feels disconnected from her parents who immigrated from Ukraine. They would be considered "old school" and didn't talk much about their past lives in Ukraine. Shortly after her father's passing Alexandra and her husband take on a new home, small and in need of renovations but uniquely situated in the city with a huge garden in the backyard. An opportunity too good to pass up they take on the challenge of restoring the house and the yard. As they begin the restorations they continuously find new, unexpected treasures. Alexandra vows to share the experience with her young son and be the mother she felt she never had growing up. As they go through the process of planning the garden, finding the right contractors and doing the work, Alexandra remembers certain aspects of her childhood. The novel passes over a period of a few years during which her mother, an avid gardener, is forced into assisted living due to dementia and eventually passes away as well. As Alexandra and her sister pack and consolidate their mother's belongings several relics from the past are found. Using old photos, and memorabilia Alexandra begins to understand a bit more about her parents past and why they did some of the questionable and seemingly embarrassing acts when Alexandra was growing up. As an adult with a child of her own there is more empathy and appreciation. I related to this book in that we bought a house three years ago that needed some renovations. My husband and I had huge plans in terms of fixing up our fixer upper. We were young and able but didn't always have the time or the money to do everything we needed to do. We have done a lot to the outside and the inside of the house but still have a long ways to go. Our individual plans do no always coincide. We then through a baby in the mix. We needed each other. I also gained a whole new appreciation for my parents and everything they did or didn't do for me growing up. My favorite part of the book was that each chapter concludes with a recipe including an ingredient found and foraged from the garden. One of the early finds in the garden were maple trees. They were able to collect sap and make small batches of maple syrup from the very beginning of their garden adventure. Although we do not make our own maple syrup we are lucky enough to have and use homemade maple syrup from Mr. J's family. I highly recommend this book if you are a child, a parent, a gardener, a fixer upper, a creative DIYer, a holistic person or just enjoy a good read. To celebrate the recipe of the book I recreated one of the author's recipes from her blog, The Best Maple Dressing Ever, with a few slight changes. We put it over simple arugula leaves. Quick, easy and delicious. Put all ingredients into a leak proof container and shake vigorously until emulsified, about 1 minute. Refrigerate. You can find this recipe along with many other of the authors recipes on her blog Foraged Love. If you would like a chance to receive a copy of Unearthed : Love, Acceptance, and Other Lessons from an Abandoned Garden by Alexandra Risen (Houghton MIfflin Harcourt, July 5, 2016) please leave a comment telling me your favorite flower or plant. A random winner will be announced at the end of the month. Disclaimer: I received a free copy of this book and was given the opportunity to give a copy away to one of my readers. In return we were requested to read the memoir, give an honest review and create or recreate a recipe inspired by this book. Please visit the author Alexandra Risen and/or the publishers, Houghton Miflin Harcourt for further information.